One of the leading commercial leasing companies, AerCap Holdings proudly took delivery of its first 737 MAX 8 at the end of last week. The aircraft will be leased to China Southern Airlines and is the first of 5 aircraft to go on lease to the airline from AerCap. AerCap and China Southern Airlines have recorded several firsts in recent years. 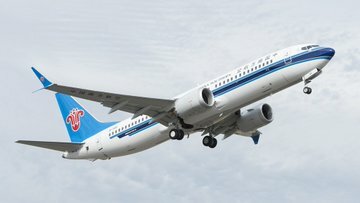 In March 2018, AerCap made history when it delivered China Southern Airlines’ first A321neo, making the airline the first operator of the aircraft type in China. In 2016, AerCap delivered the first Pratt & Whitney powered A320neo into China, to China Southern Airlines. “We are delighted to deliver the first of many 737 MAXs to AerCap, one of the world’s leading lessors. The AerCap team has a great pulse on what top airlines like China Southern prefer to fly and we are honoured that they have chosen the best-in-class 737 MAX,” said Ihssane Mounir, Senior Vice President of Commercial Sales & Marketing at The Boeing Company.